I was reading the ‘Impiana’ magazine (Sept. 2005 edition) when I saw a picture of a Bali house. I’ve never been visiting Bali before, and that was the first time I saw the Balinese architecture. In this magazine, it shows a modern Bali house design which has been blended with some other architecture style. As I read through the article, the urgency to know more about this house has driven me to look for more information on the internet. 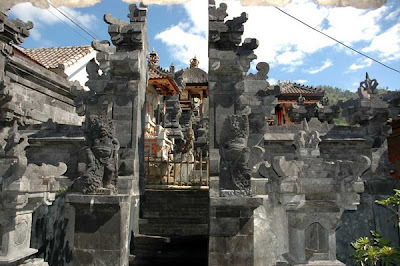 The basic concept about Bali architecture is really interesting. They believe that the temple must face the north and east corners as they considered these two areas as holy and sacred spaces. The west and south are the lowest corners for architecture, so mostly houses face these sides (http://www.streetdirectory.com/). The house temple called Sanggah or Merajan, is the place to worship the ancestor and the Hyang Guru. Below is the picture of Sanggah (http://indonezyjski.multiply.com/). This building usually a large eight-post structure on a high base. A terrace usually attached for receiving guests at family ceremony. The west pavilion or Bale dauh, is the workhouse of the compound. Serving the variety of purposes, from gathering place to sleeping quarters. Below is an example of a common Bale Dauh (http://indonezyjski.multiply.com/). The east pavilion, or bale dangin is the ceremonial pavilion. The place is where the life rites and death rituals occur. The guest pavilion for relatives and children varies in size and number according to the needs. Or the lumbung or jineng is the storage area for rice. Or paon is in the south because of the association with Brahma (the god of fire) whose place in the south. Or aling-aling, most behind the gates to deflect the malign influences. The gate is called angkul-angkul. 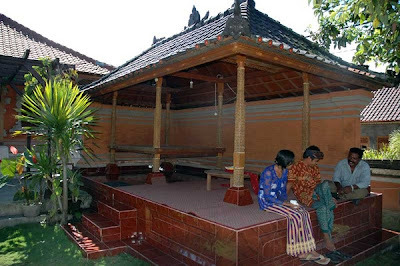 You can see a small wall called aling-aling in the picture below (http://indonezyjski.multiply.com/). There is also an article about the history of the Bali House, which you can read here: http://houseofbali.blogspot.com. 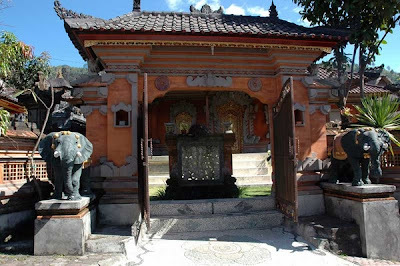 This article mainly discuss about the Hinduism influence in Balinese architecture. 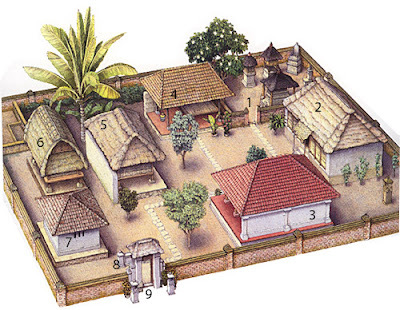 It is interesting to learn that Bali house actually consists of a few buildings but operate as a single entity. It is like having a private town in your own house. I might consider this design as my dream house in the future. The breathtaking panorama with miles of rice terraces, white sandy beaches and beautiful sunset blends harmoniously with the Balinese culture. Plan your vacation to Bali and check for discount Bali hotels now.